Now that I'm on summer break from work, I've been spending some time playing with my poor, neglected stamps. For the most part, I've been copying others' designs and building my card stash back up. It would be so nice if I could get back to designing again, and participating in challenges! We'll see! 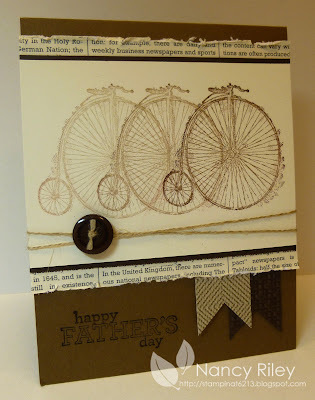 This is the Father's Day card I made for my Dad, and it was inspired by Rita Wright's card and Julie Davison's card. Miss your designs - Still check in on your picks- and follow you on Pinterest! Great card, Nancy! I said after we did this in club that I wish I'd added a mat between the image and the torn paper. :) It definitely adds to it and I'm glad to see you thought so as well. Beautiful Card Nancy!!! :) I too miss seeing your designs. Very nice card. I follow your blog and really enjoy your picks. Hellooooo out there! Love it, Nancy!